Dohuk governorate is known as mountain resort destination. It has ancient archaeological sites during all four seasons Dohuk has beautiful views which made it to be one of the best tourism sector of Kurdistan. The city is the point of joint between three parts of Kurdistan (Syria- Turkey- Iraq) therefore it has a strategic location (‘About Duhok Governorate’, 2014). This governorate is considered as one of the most significant and important governorates especially in historical and geographical sides. According to (Shingaly, 2013) because of some points like (the rapid pace of urbanization, moving from other cities to Duhok and the increasing migration from rural to urban areas) economic and social problems of population are increased. It needs commercial projects within the city with a clear plan scheme. The random distribution for commercial uses was due to the lack of a clear plan. Several issues rose from changing the Duhok master plan of land use from residential use to commercial. This affected traffic congestions change of the urban pattern and townscape, less contract of shopping and malls. This essay will address strategic action plan plans for developing the economy of the city of Dohuk with adequate developmental programs for the city. Local economic development makes it easy for Counterpart staff and partners to engage in the process of local economic development planning. This will help stakeholder to find common issues and develop a strategy that will fit key market opportunities. Also to identify quick-win projects to generate jobs opportunities, increase local competitiveness and attract more stakeholders to buy-in (‘Economic Development – Economic Development – Government of Yukon’, 2014).according to (‘Ministry of Planning, Kurdistan Region’, 2014) There are several factors that has affect or prevents the economic development. The first factor is lack of information and transparency. Dohuk’s directorates and main offices must dedicate itself to serve people in a clear way. To achieve this, the ministries should follow data and regulations. It will help local business owners and international investors to make informed decisions that will make economy grow if they have international standards of transparency and accountability. The second issue is inefficient banking system. Any country or city that wants to be successful in business and gain economic development needs a modern banking system. The banking system must be connected to world class financial institutions and build trustful relation with investors and business men/women. The third factor is educational system, which is a very important factor that needs to be taken seriously. Educational system must meet the demands of market economy. It needs to produce the skills and abilities that could help develop economy. Some certain sectors should be given more attention; in addition of English and Arabic language there should be trainings within these sectors to gain more responsive to the market and local development needs. The last factor is not having a good infrastructure. KRG should upgrade basic infrastructure and invest in it as they are one of the important factors to help economic development. The purpose of this economic development plan is to give a better quality of life to the citizens of Dohuk city and attract more people to invest in new businesses. Creating more jobs and developing existing businesses. Dohuk city’s mission is to provide and strengthen the demands of economic market. As the population of the city grows it needs business creation and reducing the rate of unemployment by creating new jobs. Attract foreign companies to invest in the city’s development and retain the companies within the city. Also getting support from KRG to help develop the economy of the city is a major point. If the city can achieve businesses to invest in residential, commercial, industrial and institutional projects, the citizens will be able to enjoy a wide range of various outdoor activities. The mission is to make the city the most desirable place to live in in the region. The mission is to gain economic and social benefits (Tutor2u.net, 2014). Such as improving living standards it can cause capita income rise and reduce in poverty. The accelerator effect of growth on capital investment, rising demand and output encourages investment in capital – this helps to sustain GDP (Tutor2u.net, 2014). Making the city richer also to have more resources available to spend on public and serving people including environmental benefits. 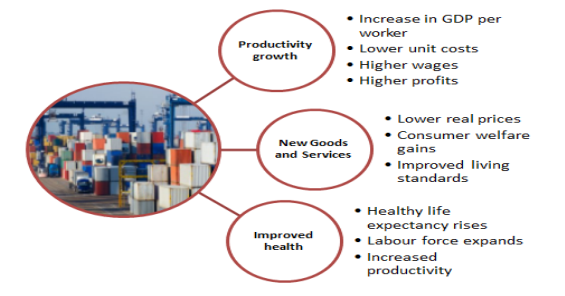 Most important is the Benefits from growth driven by technological change (Tutor2u.net, 2014). Dohuk city is encircled by mountains along the Tigris River. It has a growing tourist industry because of it beautiful weather and view though out the four seasons. The goal is to make Dohuk the main mountain resort destination. This will help economy development of the city, as well as financial and none financial support can be important point of this development. The other goals Dohuk city should achieve are, good quality of life for the citizen, better income, increasing the GDP, job creations, increasing investment. “• A phasing plan for urban development based on realistic growth projections. • An infrastructure assessment of the existing built up areas to identify gaps in service provision and potential infill capacities. Tourism is considered as of the fastest and biggest growing industries in the world. It is an attractive option for emerging markets. Dohuk city is still in the process of developing in tourism sector. it needs to resolve the existing problems such as infrastructure and site restoration as well as protection. This can make tourism to be contributor to the economy of the city. It is important to facilitate access for people, for visitors and for trade including roads, airport, rail, waterways. these high quality transportation is considered as significant support for tourism development. Dohuk has many ancient and beautiful archeological sites and artifacts which attract many visitors, historical treasures are found in these governorate including (caves, ruins and other antique yet to be found). Let’s not forget that this city is surrounded with mountains and its variation of weather, wealthy of water makes it the land of agriculture and tourism. Unsuitable roads, electric power, solid waste disposal and telecommunications. Inappropriate facilities for tourists , including accommodations, food service, rest and relaxation settings, tourist information centers, and restrooms that meet tourists’ standards. Lack of tourism education including trainings, workshops and tour guides. Security issues, which might not let just anyone from other parts of Iraq to visit the city. Recommendations and plans to develop tourism industry, (Business, 2014) suggests these point to be focused on. Set up adventure tourism program, with skilled and certified peoples in this area, especially in adventure in mountains, rivers and camping. Travel agencies, as they are the first stop for everything involved with tourists they must be up to standers. Guided tours and tour guides. A guided tour service or professional tour guide is a tourism business that specializes in providing informative and entertaining tours through an area’s local attractions (Business, 2014). Marketing tourism business using social networking sites. Set up accounts/pages on free social networking sites, Advertise in print mediums this will help the market tourism of the city. It is also needed for the Dohuk city to have a proper business plan for any sector of tourism, Explains purpose of the business, name, location, personnel needs, tourism business management staff, market sector, competition, marketing plan and financial projections (Business, 2014). agriculture in Dohuk has been affected by poor government policies, conflict, international sanctions and not having technological and educational advances. There are different kind of tenures in this area. The first one is privet ownership, second is land leased by the governmentand the third one is herniated land. This makes the number of owner unmanageable. For land, infrastructure and resources, priority should be given to rational policy allowing for private ownership of agricultural lands. Resolving the issue of ownership fragmentation through legislation. Having a law for those lands should be legally restricted for agricultural use only and also to improve water development policy. Creating employable skills and improving infrastructure, should be undertaken. The city must give attention to improved education and training leading to longer-term private sector employment. Make regular visits or workshop for those who work in agriculture and develop their skills. Formal partnership should be forged between the university schools of agriculture and the Ministry of Agriculture to increase the knowledge and skills of extension personnel. Rural/Urban Migration to rebuild and develop the rural villages. Make their economic condition better. Providing them with necessary infrastructure such as hospitals and schools. Do what is necessary to facilitate return to the villages and farming. (Economics-exposed.com, 2014) suggests there are some stages where all countries should go through for growth. Traditional society, The Pre-conditions for take-off, The Take-off, The Drive to technological maturity and the Age of High Mass Consumption (Economics-exposed.com, 2014). Technology play important role in developing agriculture for those under developed countries to develop. Financing assistance, this refers to the capital for making new business and there are several ways of growth capital such as, small business administration loan programs. Another financial assistance is venture and angel capital are two types of financial assistance venture capitalist is puts together funds of venture which is a large pool of capital that rich people invested, from pension funds, insurance companies, and other organization. Angel capitalist is smaller capital injection than venture capitalist, and it demand a smaller equity share of each business. Nonfinancial assistance to the enterprises. Such as, small business development center, business information center, women’s business center. Business creation which is a development strategy for the economy of a country is also criticized in terms of quality of life and environmental concerns, social cost and redistribution of wealth. For Dohuk city to lower the rate of unemployment, the city must attract new business and facilitate for international companies to open their branch in the city, Encouraging people to make innovation and new ideas, Supporting people with new ideas with financial and nonfinancial issues. This will give chance for more business and less employment as a result. The above sectors are few of many sectors in Dohuk city that helps to develop the economy of the city. By focusing on major points and major boundaries that prevents economic development, resolving these issues and applying the law and policies will make growth of the economy of the city. Koven, S. & Lyons, T. (2010) Economic Development: Strategies for state and local practices. ICMA press: Washington, D.C.
"Business Plan of Dohuk City." UKEssays.com. 11 2018. All Answers Ltd. 04 2019 <https://www.ukessays.com/essays/economics/business-plan-dohuk-city-3092.php?vref=1>. "Business Plan of Dohuk City." All Answers Ltd. ukessays.com, November 2018. Web. 20 April 2019. <https://www.ukessays.com/essays/economics/business-plan-dohuk-city-3092.php?vref=1>. UKEssays. November 2018. Business Plan of Dohuk City. [online]. Available from: https://www.ukessays.com/essays/economics/business-plan-dohuk-city-3092.php?vref=1 [Accessed 20 April 2019]. UKEssays. Business Plan of Dohuk City [Internet]. November 2018. [Accessed 20 April 2019]; Available from: https://www.ukessays.com/essays/economics/business-plan-dohuk-city-3092.php?vref=1.